Zoo-phonics® was developed by two experienced teachers in answer to the needs of their students. The developers of Zoo-phonics®, with its accent on reinforcement through the multi-modal approach, are convinced that this system offers an outstanding alternative to past and present methods of teaching reading and spelling. It ties in easily with any reading series, literature and language arts program that a school may use. Current research supports the Zoo-phonics® Program. It is used throughout the United States and internationally as a highly successful language arts program. Zoo-phonics® was born in the classroom. In 1983, Georgene "Gigi" Bradshaw (photo, right side), who passed away in 2011, began using kinesthetic techniques tied to phonics to teach reading and spelling to her students. Her unique and highly successful approach quickly caught on with other teachers, including her sister Charlene "Char" Wrighton (photo, middle). 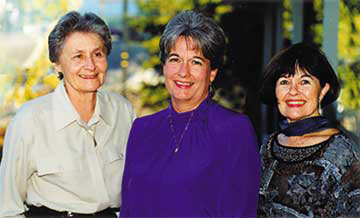 Gigi and Char, with illustrator Irene Clark who passed away in 2010 (photo, left side), took Gigi’s original techniques and made them the "Essences" and foundation for the Zoo-phonics® Program, developing a comprehensive, balanced, literature-based method for teaching reading and spelling. Gigi and Char retired from the classroom to devote full-time attention to Zoo-phonics®’ curriculum development and the training of teachers in phonetic instruction. Materials, readers and teaching techniques are continually being developed to support teachers and students in the classroom, and parents at home. Zoo-phonics® has gone across the country and the world to become an international program. Every aspect of the program has been field-tested and found to be effective. Educational research has repeatedly supported the focus of phonics in early reading programs, as well as the educational benefits of pictorial mnemonics and kinesthetic approaches to learning that are unique to Zoo-phonics®. Zoo-phonics® en español, developed by Irene Clark, was launched in the fall of 1994, using the same brain-efficient and creative teaching techniques original to Zoo-phonics® in English. Gigi Bradshaw holds a Masters Degrees in Education and Curriculum with credentials in Regular and Special Education. Irene Clark was a master of various art media, studied in the United States and Argentina and had won several awards in artistic competitions. What motivated you to create the Zoo-phonics® Program? The children in our classrooms motivated us. We were Special Ed Teachers. If the children needed curriculum adjusted to their needs, we made the adjustments. These adjustments became the "essences" of Zoo-phonics®. What do teachers find most appealing about the Zoo-phonics® Program? The joy that Zoo-phonics® brings into the classroom through the Animals, the movement, music, game format and through the ease with which the children learn the basics of reading, spelling and writing. In Zoo-phonics®, we take something that is very abstract (reading) and through music, stories, puppets and games, turn it into something that is concrete and understandable to young children. Treats the alphabet as a whole and goes from "a-z"
How does Zoo-phonics® differ from the traditional method of teaching phonics? Current research supports the Zoo-phonics® Program. Zoo-phonics® teaches lowercase letters and sounds first. When these have been learned, uppercase letters and letter names are introduced. The alphabet is taught as a whole and in sequence. Zoo-phonics® does not believe in teaching one letter per week. It teaches the alphabet from "a-z." To make it fun, the children sing and move to the Zoo-phonics® alphabet song entitled, "Come Meet us at the Zoo" (from the Zoo-phonics® Music That Teaches CD). A Body Signal is taught from "a-z" in association with each Animal. Not only is this beneficial to a young child’s physical development, but it aids memory (for "When the body moves, the brain remembers"), and it’s fun! In late 2010 we lost our beautiful Irene Clark (photo, below on left), who was our original illustrator of our adorable Zoo-phonics® animal letters. Irene helped write the original kindergarten manual with Gigi Bradshaw and developed our Spanish sister program for Zoo-phonics®. She will be missed by so many people who received her love, her beautiful flower arrangements, her wonderful cards she drew and the messages she wrote inside of them. Irene had a constant heart for others and lived tirelessly to meet their needs. She and her husband, Al, were active in helping build the Groveland Library and establish its museum before they moved to The Meadows in Napa, CA. Once there, Irene was involved in Vespers and often gave the sermons when the pastor couldn't be there. She always arranged the flowers for Sunday. Irene was there for every elderly friend and never let anyone go without a kind word, a prayer or a hug. She was a truly inspirational lady and she will be missed more than words could ever express. On September 26, 2011 Gigi passed on after living a long and full life of creativity and a love of children. Gigi was the originator of the “essence” of Zoo-phonics®. In fact, everything that is foundational to Zoo-phonics® came from Gigi: lowercase letters taught before capital letters, letter sounds before letter names, animals drawn in the shapes of the lowercase letters, a body movement for each letter – this is from our Gigi. So earthshaking were the essences of this program in its beginnings that, back when we were “homemade,” children – even children with special needs – were learning how to read, spell and write! Toddlers and preschoolers master the alphabet years earlier than is expected. Twenty-seven years later, Zoo-phonics® is used all over the United States, in homes, private schools and public schools, and in many countries worldwide. It has been translated into three other languages besides English (Spanish, Danish, Arabic). Zoo-phonics® is used in South Korea, Mexico, Singapore, Hong Kong and China, Japan, Australia, Kuwait, Egypt, Saudi Arabia, Denmark, Africa, etc. We are so proud to say that Gigi has directly influenced the education and lives of children all over the world. It is our hope that this fund will provide Zoo-phonics® materials for children around the world and scholarships for children at its sister company, the Safari Learning® Academy in Sonora, CA. This school is open to all children, regardless of economic status, race, creed, or special needs. This is in keeping with the love that Gigi had for all children. In memory of our beloved authors Georgene "Gigi" Bradshaw and Irene Clark.